This publication contains texts and projects resulting from two activities powered by two spaces for contemporary art that demonstrate a clear interest int he intersections between porosity and the field of art and education. 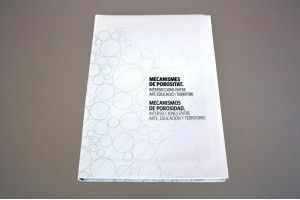 A publication that refers to two activities, conceptually coincident, ACVic Centre d'Art Contemporani organized the seminar QUAM 2012 Mechanisms of Porosity. Art, education and Territory. Lo Pati, Centre d'Art de les Terres de l'Ebre organized L'Aula al Pati, Intersections between art and education. Although each activity maintained its independence and specificity, it from the outset we agreed to connect the two initiatives. The collaboration is specified with this publication, where the papers, tests or projects presented here have been partofone of these two activities. The price is 12,00 € and it includes the mailing cost.